After weeks of speculation surrounding his future, Kansas freshman Joel Embiid has officially declared for June’s NBA Draft. Joel Embiid, a potential No. 1 pick, has official declared for the June NBA Draft. Kansas freshman sensation, and potential No. 1 overall pick, Joel Embiid has called an official end to his collegiate career after announcing his declaration for the 2014 NBA Draft at a press conference on Wednesday. 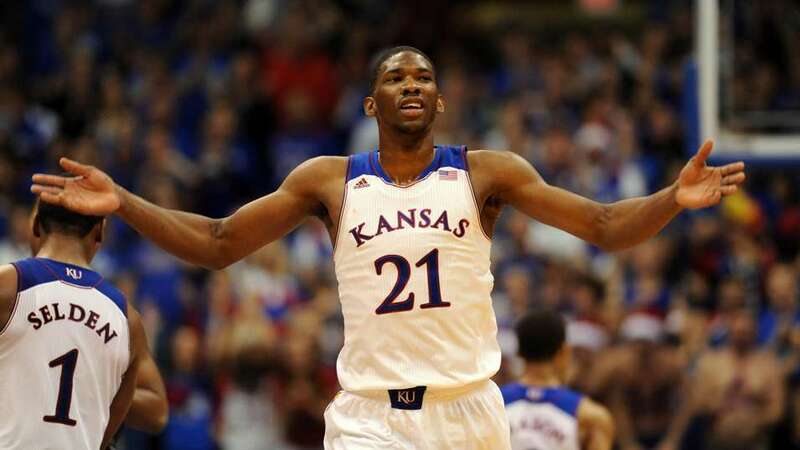 “After thinking a lot, I decided to declare for the NBA Draft,” Embiid said per the Kansas City Star. Although many believed Embiid leaving for the NBA was a foregone conclusion, he 20-year-old big man revealed he had not made a definitive decision until Sunday. His decision was made after discussions with his parents, fellow Cameroon native and current Minnesota Timberwolves forward Luc Richard Mbah a Moute, as well as other current and past NBA players. One of those past NBA players was a player that Embiid has been compared to throughout his freshman season, former Houston Rockets star Hakeem Olajuwon. “I was excited,” Embiid said of speaking to Olajuwon, who is also his idol. Embiid, who averaged 11.2 points, 8.1 rebounds and 2.6 blocks per game for the Jayhawks last season – his rebound average and 72 total blocks bother setting Kansas freshman records – joins teammate Andrew Wiggins in the blockbuster 2014 draft class, after Wiggins announced his declaration earlier in the month. The two freshman are likely to compete to become to first overall selection in June’s draft (alongside Duke’s Jabari Parker, who is yet to announce his decision), something that did not seem likely at the start of the season. While Wiggins arrived at Kansas amidst much fanfare, and with the assumption he would leave after only one season, Embiid took a much less travelled path to Lawrence, KS. A native of Cameroon, Embiid had only played three years of organised basketball before signing a letter of intent with the Jayhawks. He was discovered by fellow countryman Mbah a Moute, who was influential in him moving to the United States to play high school basketball. Much like his time in college, Embiid will be a project at the professional level. He enters the draft with questions surrounding his health, after missing the end of Kansas’ season, including both of their NCAA Tournament matches, due to a niggling back injury. However, his raw talent and high ceiling could see him have his named called before Wiggins and Parker. Embiid is second in Sports Illustrated’s Chris Mannix’s and DraftExpress.com’s rankings, and is third on Chad Ford’s top 100.